Have you been to PyeongChang? The Winter Olympics are over, but it doesn’t mean you can’t check out this spellbinding ski resort. To help you get there, I’m eagerly sharing a first-hand account of my 2018’s trip to the Gangwon province, and the ride on the KTX high-speed train from Seoul to PyeongChang. You can reach all the three places by car, bus, or train. The bus will usually be the cheapest (prices may vary depending on the bus service provider). However, it will also take the longest. Unless you’re considering driving on your own, then the KTX express train is the most cost-effective, fastest, and the most convenient option. The train runs directly from the Seoul Incheon Airport. You may also catch it at several Seoul stops, including the main train station. 2. Where does the Seoul-PyeongChang high-speed train stop? The KTX high-speed line opened quite recently. The first train departed on December 22nd, 2017. The line operates from Seoul’s airport to Gangneung, with several stops in-between. According to Inthesnow.com, the total distance from Seoul Incheon is 113.7 kilometers or about 70 miles. The train starts at the Incheon Airport and continues to the last Olympic venue. My own journey began at the main Seoul Station, and I got off at Jinbu Station in PyeongChang. 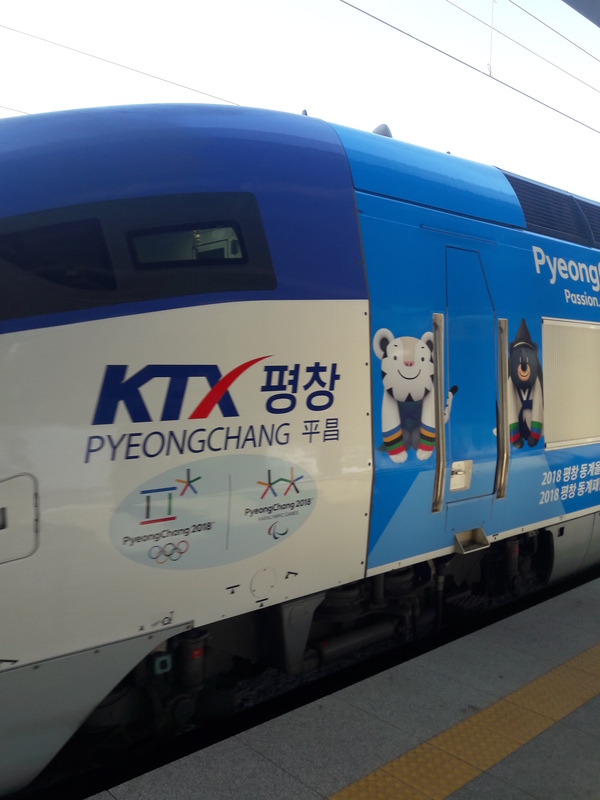 For a majority of Olympic venues in PyeongChang and Jeongseon, the train stopped at Jinbu Station, not PyeongChang! To reach Gangneung, continue to the final destination. 3. How to find your bearings around Seoul’s Main Station? Seoul Station is, by all means, one of the most beautiful and cleanest train stations I’ve ever seen. Don’t worry if you struggle with Korean — you can buy tickets from a machine, and all signs and instructions are in English. However, the ticket vending machines may not accept foreign credit cards, so it’s cash only, or you will have to go to the counter. Buying tickets in advance online is another alternative. 4. How to purchase a high-speed train ticket from Seoul to PyeongChang? At the time of writing a no-discount ticket from Seoul to Jinbu cost ₩21,900 (ca. $22). The fare from the Incheon Airport was ₩34,400, or around $35. All the details you need to know are clearly printed on the ticket, so no need to worry if you can’t read Hangul. The ticket specifies the date in English, the departure and destination stations, the train number, car, and seat, and the price. To find the platform, look for the large display boards in the station hall and refer to your train number. All announcements are also made in Korean and English, so it’s really difficult to miss your train. 5. How’s the Seoul-PyeongChang bullet train? And here comes the train! The cars are squeaky-clean, comfy, and quiet. There are toilets, vending machines, power & USB sockets, foldable chairs, window shades, footrests, and what-not. The seats offer enough space for everyone. The only downside is the luggage room. There are only three luggage racks in each car; when we chucked two backpacks over there, there was hardly any more space left. And that was with the train half-full. What happens when the car’s jam-packed with tourists, all carrying suitcases? One hour and forty minutes later (although we suffered a tiny delay), you will arrive in PyeongChang. The station is modest in size, but brand-new and elegant. There’s a tourist information desk, a small taxi rank, and a coach parking lot. We stayed in Alpensia resort, which was one of the Olympics venues. It offers free shuttle buses for its visitors. Free transport is also available to YongPyong. There are also public buses running from Jinbu, albeit rather infrequently. The fare is very affordable at ₩2,000–3,000 one way ($2–3). Taxi is another way to get to the resort. The regular fare to Alpensia, which is about 17 km (or 11 miles) from Jinbu, is ₩30,000 (ca. $29). Enjoy the snow, the spectacular landscapes, scrumptious food, and Korean hospitality. P.S. Scroll down for a bunch of useful links that can help you travel around South Korea. Have fun in Korea! And share your travel experiences, I’ll be interested to learn your opinion!